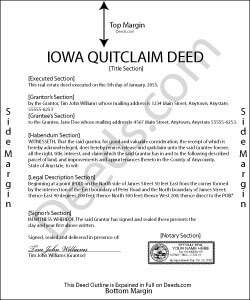 Iowa Code 558.19 provides the statutory form of a quitclaim deed. The minimum statutory contents are the names and addresses of all grantors and grantees, the consideration (usually money), and a complete legal description of the property. 561.13 adds the requirement for both spouses' signatures when conveying a property identified as a homestead, regardless of whether or not both have an ownership interest in the land. The grantor must sign the deed and all signatures must have the signor's name typed or printed underneath, and be acknowledged by a notary or other court-authorized individual. 331.606B lists the information that must be on the first page of every document submitted for recording. These include the name, address, and telephone number of the individual who prepared the quit claim deed, the name and address of the person to whom future tax statements should be mailed, a return address for use after recording, the title of the instrument (in this case, "Quitclaim Deed"), tax parcel ID, and a document number or book/page information for the conveyance that transferred the land to the grantor. Iowa Code 331.606B lists the statutory document formatting standards. *	The pages should not be permanently bound or connected to each other. Do not clip or attach anything to pages. *	Use minimum 10-point text in permanent black ink for all printing. *	Print all documents on minimum 20-pound weight, plain, white paper. *	All signatures should be original, and in permanent dark blue or black ink. *	Format the first page with a three-inch top margin, with " margins on the left, right, and bottom. All other pages should have " margins all around. Iowa follows a "notice" recording statute, which is defined in Iowa Code 558.41. The statute states, in part, that an "instrument affecting real estate is of no validity against subsequent purchasers for a valuable consideration, without notice . . . , unless the instrument is filed and recorded in the county in which the real estate is located." 558.11 identifies the index of deeds, in which correctly recorded conveyances are listed, and which serves as formal constructive notice. So, a "notice" recording statute basically invalidates unrecorded deeds. For example, the grantor quit claims his/her interest in the property to grantee A for value, who fails to record the deed, and the grantor then quit claims the same property to grantee B for value, who records as directed by the statute. In most cases, grantee B retains ownership of the real estate. In short, recording the quit claim deed as soon as possible after it's executed is a simple and effective way to preserve everyone's interests. Dretha W. said: Ordered the fill in the blank form for a deed. Very professional looking but more importantly, correct for my recording office. It was recorded with no question. The guide was a big help in completed the deed. Reply from Staff: Great to hear Dretha. We appreciate you taking the time to leave your feedback. Have a wonderful day! Altaray S. said: Really fast turn around time, and was provided exactly what I was looking for this time. This is my first experience with this site. It would have been cool to also get a document depicting/describing a property line, but like I said before, exactly what I was looking for this time. Reply from Staff: Thank you so much for your feedback Altaray, we really appreciate it. Christine L. said: I would like the ability to edit the document. Reply from Staff: Thank you for your feedback Christine. Sven S. said: great experience so far! Im using Deeds.com for e-recording. Easy to use website, document upload is a snap, you are walked through and reminded if theres something missing. Reply from Staff: We appreciate your business and value your feedback. Thank you. Have a wonderful day! Reply from Staff: Thank you Gary. Miljana K. said: I was on several sites but this was the easiest and cost effective. No bait and switch like on several sites where you get a "free trial" and then they started billing you monthly for legal services. Excellent. Select County where the property is located.